Churna Island, the paradise on earth. One of the most beautiful island in Pakistan. It is the only island in Sindh to have crystal green water. The rocky island has no shores, and the water there is as calm as it gets. Rich in wildlife, Churna Island is not only a very popular spot among tourists, but the local fishermen also come here a lot. It truly is a beautiful blessing, one that you will not want to miss. If you have never been to an island, you have no idea how much you’re missing in life. What and where is Churna Island? The only island in Pakistan that offers snorkeling and cliff diving! Churna Island is around a kilometer long. With clear green water and a khaki rock mountain in the middle, this is one of the most stunning places in Pakistan. It is located near Mubarak Village, the second largest fishermen community in Karachi. The ideal time to visit Churna is between November and April. The mystery behind the water seeming to be warmer in winters than summers has really makes it a wonderful experience, and a big tourist spot. You won’t know until you’ve been in the water! When the peak season begins, people from all over the globe come to visit this absolutely stunning island. Once you visit it, you will want to visit again and again. The journey is just 2 hours long from Karachi. The tour guides tell you the history and all there is to know about the Churna Island. From wildlife ranging from snakes to whales. One thing that is for sure that Churna has one of the best waters in the world. The island is well kept by the locals there, that there is not a single sign of pollution present there. The clean island and peaceful water make you feel really relaxed and fresh. A best spot for taking aesthetic pictures, the view are beautiful and look really aesthetic once the sun sets. This is your chance to visit the heaven in Pakistan. From exploring caves, to cliff diving, you’ll experience it all. The locals there are very friendly and hospitable. Especially, the fishing community. They love having visitors and tourists over. For them, it is their treasure. A treasure that provides them food, shelter and some other basic necessities in life. Churna is also very famous for the blue whale sighting. A blue whale was spotted near the island, and since then many other whales have also been spotted, like the killer whales and the Baleen whales. Come spot whales with us! Churna Island is an hour’s boat ride from Mubarak village. The route leading to Churna Island is beautiful. Especially, in the winter seasons. The hazy roads, cool breeze and the sun shining down. View words can’t describe, and never will. The journey from Karachi to Churna is short, around 2 hours. But once you reach Churna, you won’t be ready to leave. The distance from Sunehra Beach to the Island is covered on boats. As you sail through the crystal clear, green water, you will be able to see all the marine life living in the waters. The locals usually stop the boat after traveling for some time, so people are able to take photos and just take in the beautiful sight in front of their eyes. 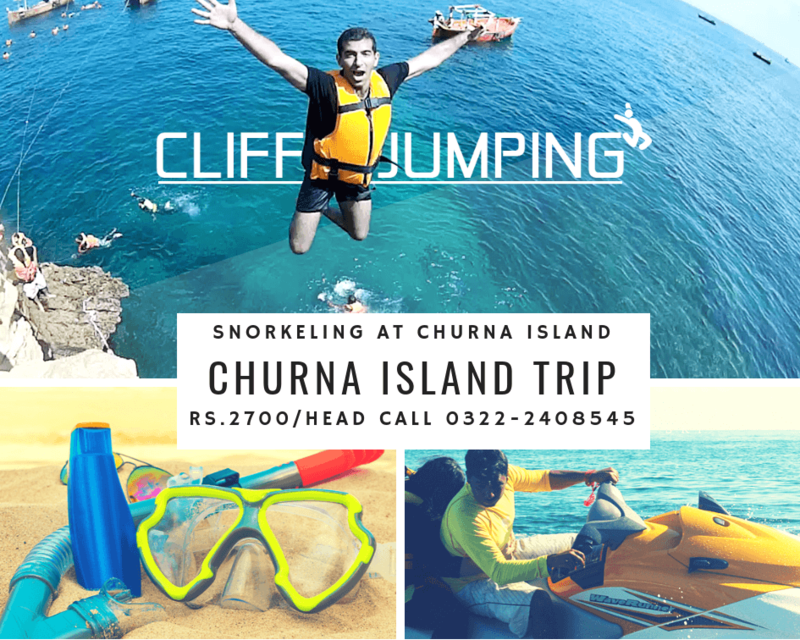 Once you reach Churna Island, the adventure awaits you. Swim with the fish, Dive off the boat and take a swim in the crystal green water! Probably, the reason why everyone loves going there is snorkeling. Get some swim fins on, wear your diving mask (and life jacket of course!) and jump into the clear green water. You would be able to observe all the marine life, like never before. You get to swim with the fish, photograph them and so much more. It’s all completely safe, and the lifeguards are present there at all times. Swimming along the seabed, watching the fish closely and getting pictures of the marine life. It’s all possible with us, on the Churna Island. 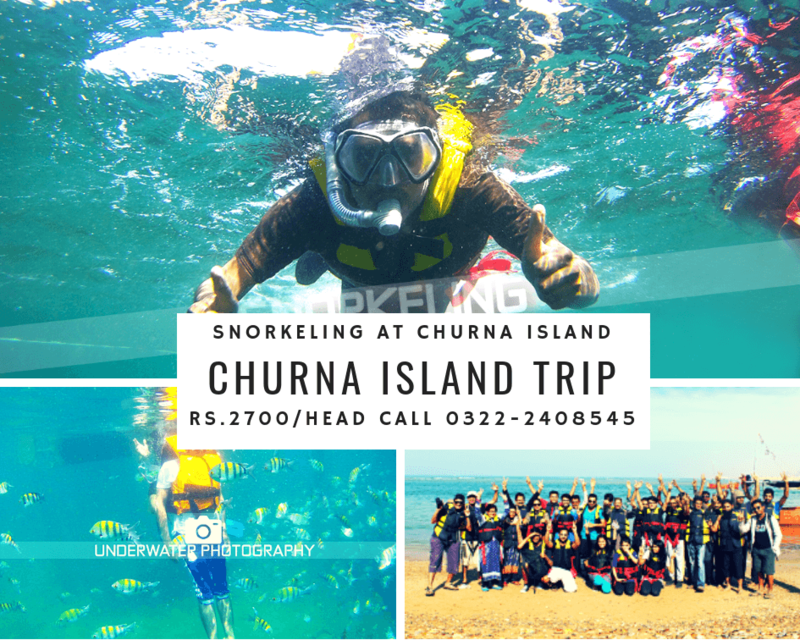 Another thing you will enjoy is swimming in Churna Island. All you need is a lifejacket. Dive into the warm waters and swim your heart out. You can float, you can just stay still in the water and admire the Island. You can do whatever you want in the water. Jet Ski your way through the island, there’s nobody stopping you! One of the best things about this trip is Jet Skiing. Take a ride through the waters with a professional driver and enjoy the breeze against your face, as you look at the view. The best part about this is that the drivers even let you drive alone. A trip along the Island on your jet ski, just you and your thoughts. The best way to face your fears and enjoy the thrilling adventure. Dive off the 80 ft. Cliff straight into the beach! Talking about facing your fears, there’s no better way to do that than cliff diving. The famous cliff that has been made available for cliff jumping, is up to 80 feet high. The safest cliff diving in town. Turn your adventure up a notch, wear the safety gear and jump off the cliff, into the water. We’ll take pictures as you fly! No better way to end your fears. Put your skills to the test with Overnight Camping. The famous bonfire will also be lit for you, bring marshmallows! The Island also offers bonfire and camping overnight. What a perfect view it would be, to have a bonfire on an Island while stargazing. The locals usually come over and bring the fish they catch in the morning. They make the tastiest fish ever! Listening to their stories, socializing with your friends and having a bonfire on a chilly night, all that with us on The Churna Island. Capture the moments underwater, with our waterproof cameras. The focus is on you! Check other packages of Sindh and Balochistan like Gorakh Hill Station Tour, Sapat Beach Trip, Gondrani Cave City, Moola Chotok & Kund Malir Beach , For Reviews and rating of all trip visit our facebook page.